We wouldn’t consider the macOS app launcher space a crowded one, but there are enough options out there that could make you think twice about clicking the download button. After numerous keystrokes and much reflective deliberation, we think that Alfred is the favorite launcher for macOS. If you are a Mac user, then you have a launcher already installed. 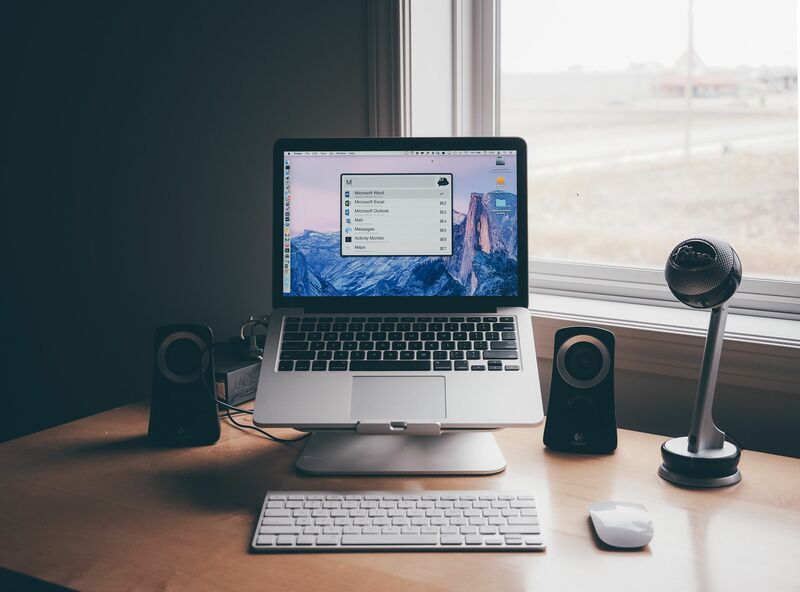 Spotlight has been a part of the Mac OS ever since version 10.4 Tiger, and even though its feature set has evolved since then, its purpose started out simple: To help you find and launch files and apps faster than it would take you to navigate to the location with a mouse. While Spotlight wasn’t the first launcher for macOS, today it sits among a variety of good choices for you to pick from. But the word “launcher” has become less of a descriptor of what you are getting and more of a legacy term. Launchers now give you instant feedback like showtimes, news, and articles, and they’ve also become sort of an automation playground offering plug-ins and scripts for you to accomplish a series of tasks with just a couple of keystrokes. With its history in mind, we sought to find out which launcher gave us the best experience in daily use while also offering powerful features to those who wished to take advantage of them. Features: With launchers now doing much more than opening your apps, we wanted to find one that carried a robust set of features that could cater to a beginner, but also allow more seasoned users to customize things to their liking. Ease of Use: Every launcher is going to have some sort of learning curve, but we aren’t looking to spend hours toggling preferences and reading support articles just to get the basics down. Being able to intuitively dig into an application and figure out most of its features by poking around for a few minutes is the type of usability we want to see. Speed: You are using a launcher because you want to open something faster, so speed is critical. If the app isn’t at your beck and call when you need it, then what’s the use of keeping it around? Appearance: Just like if you launched an iPhone app today with an iOS 9 design, it would feel jarring and out of place. A launcher that matches current aesthetic of macOS is a must. Price: Paying for great software is a satisfying feeling, but paying for software that doesn’t live up to its promise is irritating. When examining the launcher space, how much you are getting for the price does weigh in on our decision, but it isn’t the heaviest factor. A lot of work is put into making these applications awesome, and helping the developers try to make a living doesn’t hurt. Being the new kid on the block can have its advantages, but only if you know how to leverage them properly. 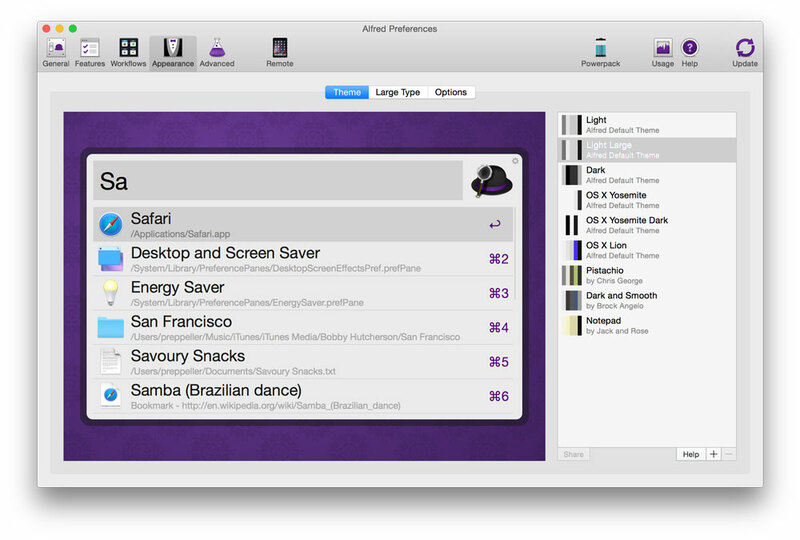 Our favorite — Alfred — is able to do just that when compared to LaunchBar, Quicksilver, and even Spotlight. What Alfred does best is incorporate different features from its competitors and implement them in a distinctive, easy, and understandable way — all while offering more power for advanced users to take things further. Additionally, it offers a unique iOS companion app and has features like Workflows that allow you to be more efficient and stay productive. Alfred 2 is a free-to-use application with an option to buy their Powerpack which will unlock more capabilities such as custom workflows, fine-grained theming, Dropbox sync, QuickLook, and 1Password integration. The developers at Running with Crayons have done a great job divvying up the free versus paid features in such a way that doesn’t feel limiting to someone who wants to try out the app. If you’re looking for more flexibility than what Spotlight has to offer, Alfred — sans-Powerpack — is a great option. But if you’re the type of user who’d like to explore all of the power and customization that this launcher presents, the $26 asking price for the Powerpack is well worth it. 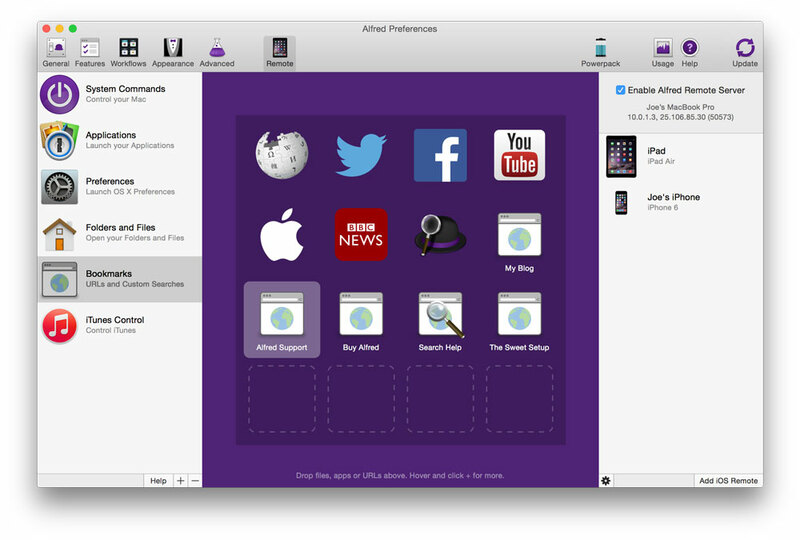 For the purpose of this review, we’ll be using Alfred with the Powerpack add-on. Let’s dig in. On first launch, Alfred is unmistakable compared to its peers. Its hat and magnifying glass sit on the right side of the search bar as a reminder of what app you are in. But the developers are realistic and realize that the Alfred look may not be for everyone, so they’ve provided a number of ways to make Alfred look how you want it to. You can even strip the Alfred search bar down to just a white rectangle. There is a very active Alfred community online that are making themes, and they are able to share these through URLs that are simple to import and export. Large Type is another unique feature for Alfred users. When using the app, you can tap Command + L and the text you were currently typing will pop over on your screen in massive scale. I’d imagine this as a great accessibility feature, among other use cases. Alfred’s preferences run as a separate process from the utility itself. Although there could potentially be hours spent on customization, what’s great about navigating through each option is that a summary of what that option does is placed directly below it. This is a huge help for beginners who may want to unleash the full potential of the app. At the heart of any great launcher is its search capabilities, and Alfred provides you with a number of methods to get you where you want to be — fast. In Alfred’s preferences, you have control over whether it searches every folder and file type, to specific things like indexing preference panes and metadata on your machine. Its local search is also powerful. You can do things like search for a folder name, tap the right arrow key, and see the sub folders and files within it. It also adopts Apple’s QuickLook feature which can be activated with the shift key. Another nice touch is that you have the option to provide fallback results. If a search term comes up empty, you can tell Alfred to default to services like Google, DuckDuckGo, IMDB, Wikipedia and Amazon or even set up your own custom search engine. Speaking of websites, its internet search capabilities get even cooler. For an example, a nice default search is set up for Twitter. I can type the word “Twitter” into Alfred and that keyword can have a one-to-many search criteria. One of them is “Open Twitter User,” so if I type “Twitter MacSparky” and hit return, it will open my browser to David Sparks’ Twitter account. What’s more is that every single aspect is customizable, but not in an intimidating way. You can leave things as-is and still enjoy the application, but if you have the time to get into Alfred’s preferences, you’ll be happy that you did. 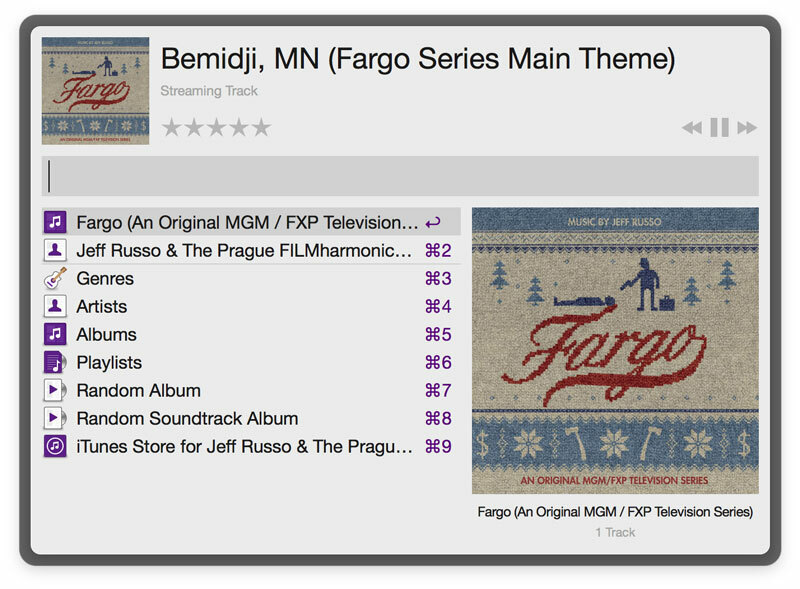 Alfred integrates with many different aspects of macOS from system level commands to full iTunes control. The application is so seamless when in use, that you sometimes forget it’s from a third-party. Before we go over its marquee feature — Workflows — let’s explore what else the app has to offer. Much like Spotlight, Alfred can do basic math, but it also has the capabilities to perform advanced calculations based off the GCMathParser. It can perform functions like getting the sine or cosine of number. The calculation results can be copied to your clipboard if you tap return. Alfred’s dictionary is super smart. You can type terms like “define Avalanche,” and it responds promptly and accurately, but the feature that we love the most about the dictionary is when it comes to spelling. If you aren’t sure about a particular spelling, you can type “spell” into Alfred, start trying to spell the word, and Alfred will — in most cases — find the correct spelling that matches what you are typing. And, just like with calculations, it will copy the correctly spelled word to your clipboard with an additional keystroke. When searching through your contacts, you have the option to see the information right within Alfred as opposed to opening the macOS Contacts app. In addition to quick, glanceable data, you can launch a new email to a contact through either Mail.app or the Gmail web interface. 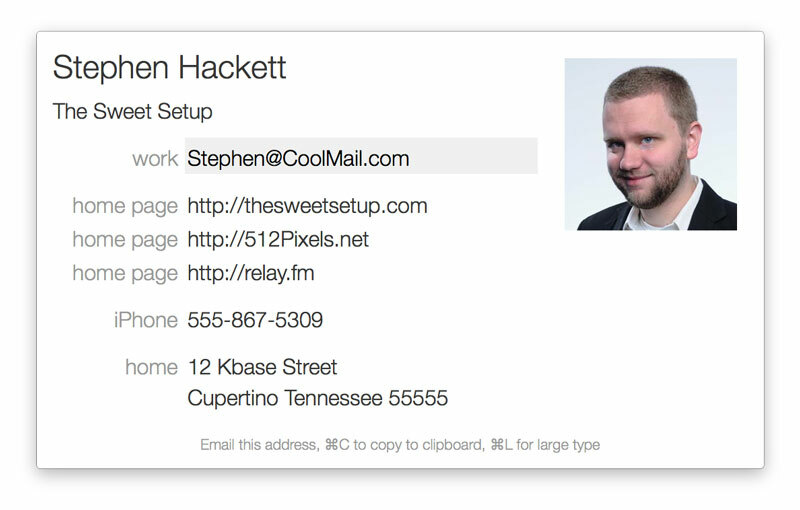 Depending on what else is filled out on a given contact card, you can open an address in Apple Maps, start a FaceTime call, and a lot more. There isn’t a lack of control in Alfred, that’s for sure. With deep ties into the operating system, you can type in a keyword like “Sleep,” tap enter, and your computer will…well…go to sleep. Certain keywords can also be toggled to confirm actions prior to executing them, like shutting down your computer or quitting every application you have open. iTunes control is another great example of how Alfred immerses itself into your OS. Having the ability to bring up a custom mini player and type “pause” or “mute” makes controlling your music a quick and easy task. In the iTunes Mini Player feature, you have full access to your artists and playlists, can search your entire library, and see album art preview for fast identification — all without dealing with iTunes directly. Alfred takes your privacy seriously, and that’s why their powerful clipboard manager is off by default.1 But when you are ready to tap into its functionality, it has capabilities that will surely make you more productive. 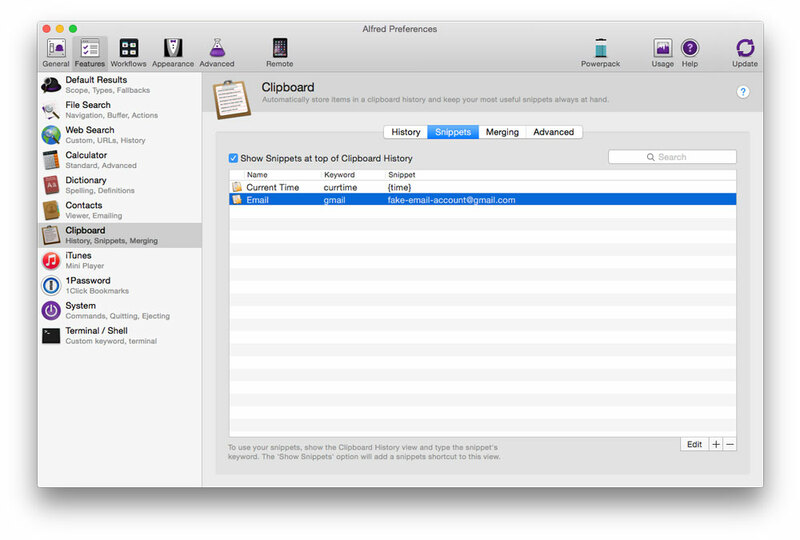 You can set Alfred to keep clipboard history from twenty-four hours to as long as three months prior. Having access to this data is great for collecting links or passages and gives you the ability to consult a list of your clipboard history so that you can paste text in a more efficient way. You can even merge multiple copies by holding down command and double-tapping C to append text to the previously copied text. The only limitation in Alfred’s Workflows is your imagination. It is that flexible. The purpose of creating a workflow in Alfred is to allow you to tap into other applications or services by using keywords and hotkeys that trigger a series of actions or scripts. It sounds like it could be complicated, but the developers have built a nice GUI that lets you see how your workflow connects and functions. What’s more, if you are familiar with scripting languages, it opens up a whole new dimension of capabilities. 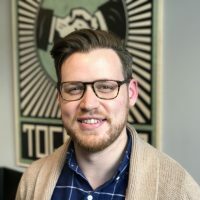 The best thing about Workflows is that if you aren’t the tinkering type, there is a developer community that posts their workflows to Alfred’s forums, Reddit, and Github. Some of the stuff they come up with is magical, and what we like about it is that you can view or modify the workflows once imported. Instead of us describing how to build a workflow from scratch, we decided to share a couple that we think are awesome. AlfredTweet 2: With the exception of actually seeing your timeline, AlfredTweet can do everything else like following or blocking a user, to DMs, or even pulling up your lists. It also includes some additional tricks like tweeting out what you are currently listening to. Shorten URL: There are a number of reasons why one would need to shorten a URL. Sometimes it’s for aesthetic purposes, and other times it could be so that you can squeeze more text out of a tweet. This is where the Shorten URL workflow comes in handy. It can shorten a URL with six different services (goo.gl, bit.ly, t.cn, etc.) and copies it directly to your clipboard. TimeZones: Another convenient workflow is TimeZones. By default, it will give you the timezones of a base set of cities, but it is customizable so that when you bring up the keyword it shows your favorites for a quick glance at their current time. ImageOptim: Here is an example of a workflow that requires a little setup, but pays off in a big way. The ImageOptim workflow for Alfred gives you the ability to select multiple JPEGs or PNGs and will batch optimize them in the background. Once it’s finished, it notifies you exactly how much space you’ve saved. Search Pinboard: From 512 Pixels, some simple workflows to search your Pinboard archive. Evernote workflows: This forum favorite puts all of the power of Evernote just a few keystrokes away. It’s really remarkable. 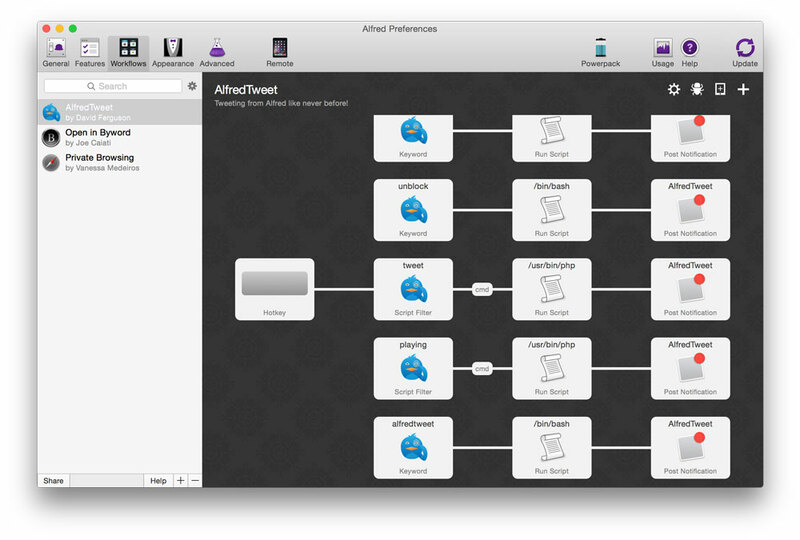 These six workflows are just a taste of what you can do in Alfred. Workflows satisfy the needs of simple tasks, but also has the power and capabilities to do amazing things. A great starting point to find more workflows is in Alfred’s own forums. Earlier this year, the Alfred team released a companion app for iOS that is just as impressive as their Mac app. Alfred Remote, which is completely customizable, allows you to trigger actions on your Mac via iOS. It comes preset with a number of default actions, but if you have the time to arrange it to your liking, you can make Alfred Remote work for you even harder. We see the potential for people not finding use cases for the app, but it’s definitely an added bonus for power users who’d like another option for control. Alfred Remote costs $5 and is a universal iOS app. We know that some of you may be thinking, “For an app that’s supposed to help me be more productive, there sure is a lot of customization and ability to get lost in tweaking settings,” but don’t get overwhelmed. Our best advice to new launcher users is to use them as-is in the beginning, and when you find that you can be doing something more efficiently, then look into if the application can offer you the functionality. We think Alfred does the best job at giving new and power users all of the tools they will need in an understandable, nicely-designed package. You can’t talk about launchers without talking about LaunchBar. It has been around longer than Spotlight and has a very loyal user base — a user base that may be shocked and bewildered that their app wasn’t crowned the winner. It could be argued that LaunchBar matches or surpasses Alfred’s abilities as a launcher, but we thought that Alfred did some key things better — particularly its first-launch experience, intuitive usability, and free option for new users. A user coming from an app like Spotlight may find it difficult to navigate through LaunchBar on initial launch. Your first instinct is to type search terms and do something with them while having the option to backspace and fix mistakes. But things are done differently in LaunchBar. You can’t just type “Samuel” space “Jackson” and be able to do something with that text. By typing that into LaunchBar, it would actually result in bringing up a smiling face emoji (granted he isn’t in your contacts). LaunchBar doesn’t give you full live-preview of what you’re typing, and this can make a new user feel unsure that they are actually on the right track. If your search doesn’t result in anything local, you aren’t greeted with fallback search options like Alfred offers, and unless you trigger an action with a keyword, the spacebar doesn’t separate text. Instead, it’s used in different ways within LaunchBar like opening a directory or performing a QuickLook. Its one-to-many functionality could get confusing at times. In addition to the way it takes in text, its preferences aren’t the best resource for learning specific keywords that you would need to know for navigation. Alfred does a great job in keeping their preferences uncrowded, yet they explain what different keywords and options do throughout each pane. Things just feel less intuitive when you first use LaunchBar, but after you have done some homework, tweaked some settings, and have learned its syntax, it can provide you with power and integration at the caliber of Alfred. When thinking about LaunchBar and what it has historically brought to the table, it has always seemed to cater toward the power-user market more than any other group. Is it fast, powerful, pretty, and full-featured? Absolutely. And we don’t want to discount LaunchBar as a viable option, but after much consideration and consultation with other Sweet Setup staff, we thought that Alfred edged it out for the top spot. LaunchBar costs $29 for a single license and allows a 30-day trial period. You can continue using LaunchBar after the trial period, but it imposes short breaks while using it to encourage you to purchase a license. Quicksilver is another veteran launcher that is open-source. Although it has maintained development sporadically over the years, its unique way of searching requires a complete change of mindset. It uses an object + action + argument style of search, and we found that the learning curve — even for advanced users — was more involved. Its user interface doesn’t look too outdated, but it doesn’t match the macOS look very well even after playing around with the color options. That being said, with its extensive plug-in collection and active community, you can unleash a ton of power, but only after digging around and tinkering with its overwhelmingly customizable preferences. Quicksilver is a free app. Having Spotlight built-in to macOS has its advantages. With this out-of-the-box functionality ready to go, it is the first search tool a new Mac user is exposed to, but I’d like to think that it serves as the training wheels to more powerful utilities. Spotlight has made some big jumps in macOS recently. The Spotlight window moved from its comfortable top-right corner home that it’s had since OS X 10.4 to the upper-middle section of your screen. It includes new search categories to try to give you more options in your results, and it also brings better auto-completion for search terms. The bigger search box allows for the use of split-view results that are located directly below your search. The left side of the split-view shows the results from different categories, and when a specific result is highlighted, a description is given on the right side. 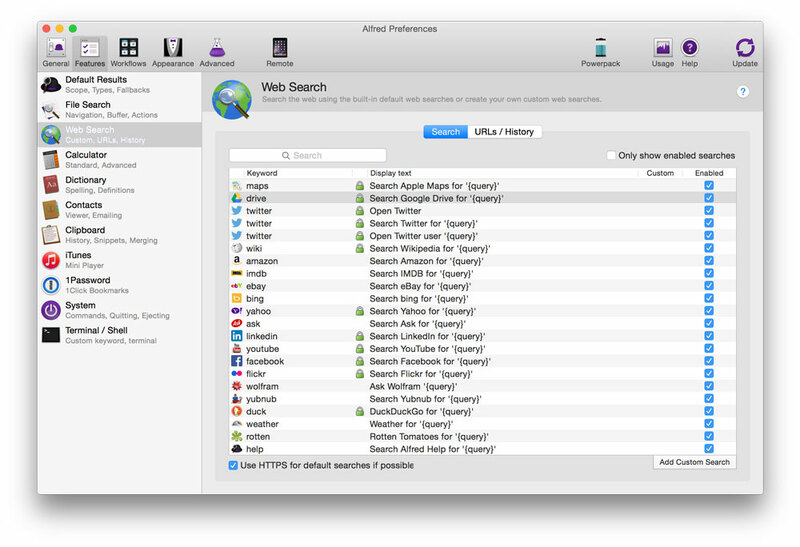 Prior to Yosemite, searches in Spotlight could find files, apps, email messages, dictionary definitions, contacts, and give you the option to search on the web. Additionally, there were some nice tricks like typing in simple math equations that would result in an answer. After Yosemite, Spotlight takes your searches further with the introduction of Spotlight Suggestions. Similar to iOS, Spotlight Suggestions search the iTunes, iBooks, and App Stores. It also searches locations of places nearby, news articles, Wikipedia, movie showtimes, and Bing. Spotlight’s calculator has also become smarter with the ability to convert distance, temperature, and currency. And with later versions of macOS, Apple continue to add more functionality into this great app. These new features are a great introduction to applications like Alfred and LaunchBar, but they’re just an introduction. Spotlight may be doing more now than ever before, though I still wouldn’t call it a power user’s product. Its settings are basic, allowing you to uncheck search categories and set basic hotkeys, but Apple didn’t set out to build a complex feature set for macOS. Instead, it set out to build a user friendly feature that tries to serve both its most basic users and experienced ones. If you don’t need the extra bells and whistles that a third-party search utility gives you, then Spotlight is a great default choice. Spotlight is free and preinstalled with macOS. Like we said, there aren’t too many launchers to choose from, but each offer a unique way to get to your stuff faster. Alfred and LaunchBar are both great choices, but Alfred’s usability factor, option for free users, custom workflows, and iOS companion app were the ultimate reasons we decided to call it our favorite launcher for macOS.